Here in St. Peter's we work really hard to keep our attendance high among all pupils. 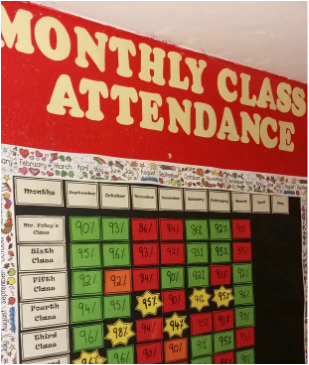 Each class teacher implements their own attendance initiatives, the class with the highest attendance each month is named in our monthly "All Star Attenders" blog post along with any children who have full attendance for the month, and receives a class prize. We also have end of year awards for best and most improved attenders in the school. When is a Child too sick for School? Parents have often told us that it is hard to know whether a child should be kept home from school or not due to illness. Should a child stay at home if they have a cold? Does a temperature mean a child is too sick for school? Here at St. Peter's, with the help of Ballymun Whitehall Area Partnership, we have put together an Attendance Guide Booklet with ideas on how you can help your child improve attendance and identify when your child is too sick for school.